Honda sold just 1,242 Insight hybrids in Europe last year, according to JATO Dynamics. TOKYO (Bloomberg) -- Honda Motor Co. will end production of the Insight, the first hybrid vehicle introduced in Europe and the United States, after demand plunged and sales lagged behind Toyota Motor Corp.'s Prius hybrid model. Honda informed dealers in November that the current generation of the gasoline-electric Insight will be discontinued this month and asked them to stop taking orders, Yuka Abe, a Tokyo-based spokeswoman for the carmaker, said today. She declined to comment on whether there will be a new version of the model. Honda will sell off its remaining European stocks of the Insight five-door hatchback and the CR-Z sports coupe hybrid, a company spokesperson told Automotive News Europe recently. The Insight was the first hybrid vehicle in the European market when Honda introduced the two-seat variant in 1999, seven months earlier than the Prius. The Toyota hybrid went on to become the best-selling dual-powered car of all time, with cumulative global sales of 3.19 million vehicles as of January, according to the company. By comparison, Honda delivered a cumulative 280,629 vehicles of the Insight as of the end of last year, of which 157,275 were sold in Japan. European sales of the Insight plunged 62 percent last year to 1,242, according to figures from market researcher JATO Dynamics. In the U.S., deliveries of the model fell 18 percent to 4,802 in 2013, making it the second- worst selling car in the Honda brand lineup, behind only the CR-Z hybrid, according to researcher Autodata Corp. Honda began this month with 237 days' worth of supply of the Insight, according to Automotive News' Data Center, almost four times the 60-day inventory that automakers generally consider to be ideal in the U.S. market. Honda's hybrid fortunes contrast sharply with those of Toyota, which sold 153,000 gasoline-electric variants of its Toyota- and Lexus-brand models in Europe, up from 107,000 the year before, the company said. The majority of those were hybrid versions of the Auris compact and Yaris subcompact, both of which are produced in Europe. 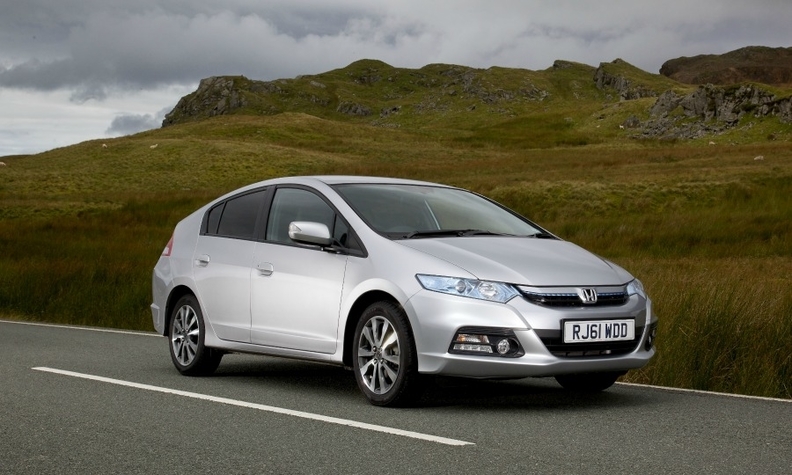 Honda stopped production of the first-generation Insight in 2006, before reviving it in 2009. Honda's hybrid lineup also includes the Accord sedan and the Fit or Jazz subcompact car. Honda has said no decision has been made on whether Europe will get the hybrid version of the new Jazz that is due in 2015.